Robbie's article got me thinking about gaming IRL - which is to say, the overlap between our persistent real-lives, and the pursuit of gaming as a past-time. As I've said before, I think gaming demands a lot more infrastructure - in terms of technology, mental resources, and time - than the other widely consumed media, and as such, it naturally has a particularly intrusive relationship with our everyday lives. Recently I had an insight about my gaming hobby-turned-habit and did something I haven't done in a surprisingly long time: I stopped gaming for a few days, and my return to gaming since then has been vibrant, positive, and newly enriched. In the spring of 2013, a few friends convinced me to try the free-to-play MOBA game League of Legends. Unlike me, they'd played Dota back when it was still a mod in Warcraft 3, a game unplayable for me, given my daily commitment to World of Warcraft at the time (Blizzard is watching you; Blizzard loves you). I remember vividly my first encounter with MOBA following the tutorial. I subscribed to Riot's LOL channel, and unlocked a free cosmetic skin for this stupid minotaur character called Alistar. My first game was on Twisted Treeline, an atypical 3v3 map, and my first impression was total confusion. Where is my guy? Where did my cursor go? What does that guy do? Why can't I move? Am I dead? Oh, I'm dead. However I knew there was a structure underneath this chaos and I wanted to understand it, turn it to my advantage somehow. I started grinding out late nights and brewing up obscure strategies with friends. I curated a collection of characters - you only have access to the ones you purchase either with Monopoly money or credit card - and devoted long hours to researching the current strategic trends in between my university classes. I was happy to put up money for a game that was free-to-play in the first place. In a sense, I owed it to them - and there were so many cool and powerful characters to get to know. Eventually I joined Ranked matchmaking, the League among Leagues, and spent months oscillating up slightly and then down slightly at a just-below-mediocre skill level (I think I was Silver IV). Regardless of my failure to significantly progress, I played fervently whenever it was possible. 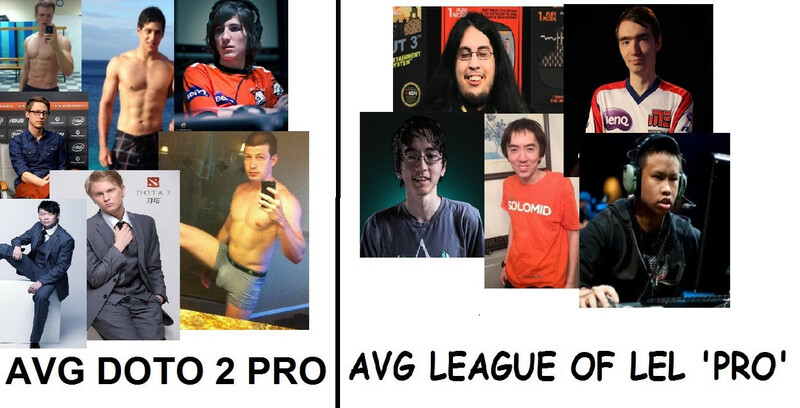 I think it was around October of that year that I hit a stagnant point with my interest in League. Riot loves to release overpriced, overpowered characters in order to push sales, only to neuter that character as soon as the next flavour of the month arrives. Most changes to the game seemed arbitrary, motivated more by Riot's fiscal dependence on their only product than on creating a Good Game. Across the various forums I trawled, I saw constant reference to Valve's Dota 2 which had recently entered open beta. Everything I heard about Dota 2 - the free access to the full character arsenal; the darker, mature visuals; the powerful abilities and impactful gameplay - made me feel like a kid with a Sony Discman walking past the apple store. I had found the master race. It was blatantly obvious which was the better product; and it was merely my investment in this pile of CDs (read: purchased League characters) which discouraged me from making the transition. I downloaded the also-free Dota 2, and within a month I had uninstalled League of Legends entirely. It became clear to me very, very quickly that, compared against League, Dota 2 had a deep design and respect for its players that had put me off of the former. In Dota 2, I could talk to my teammates on microphone in-game. I could customize my characters' appearance. I could play all the characters without buying them, and watch replays of my own games to observe my mistakes. Everything that i struggled to actualize in League of Legends, I was able to do in Dota 2. But what I found out later was that both games were preventing me from actualizing much more important things in my life. See the big red dot on Feb 8/15? That's me not getting the message 12 times in a row. According to Dotabuff Plus, a third-party personal stats tracker for Dota 2, I played Dota nearly every day between December 18th 2013 to August 2nd 2015. That added up to about 1800 hours over 20 months, averaging 3 hours a day for over a year and a half. These statistics include the rare 2- or 3-day interruption of a broken keyboard or internet failure, and a few 2-3 week vacations in 2014. Throughout this time I continued to "attend" university classes, "maintain" a relationship with my significant other, and work in kitchens. My attachment to these competitive battle arena games led my fourth year of university to be my worst by far - I got a 51 in a 400-level class out of sympathy, and the final required course for my program is still ungraded as I could never work up the nerve to submit my final project. MOBA games compelled me to become markedly more anxious and irritable in my relationship with my girlfriend and my family; whether winning or losing, I would leave every match or string of matches with that intense, twitchy anime thing on my brow. It was not a good time and I was oblivious to that. You see, I don't think there's anything inherently wrong with playing any sort of game (except maybe clicker games but... those aren't even games, dude). In fact I think it's fully possible to game every day in a healthy manner. Games are awesome virtual realities which allow us to explore patterns and possibilities at no risk to our real lives and identities. While I was engaged with Dota 2 and similar games, I became, for a time, more studious, constructive, and diligent than I am with most other activities in my life. I very closely analyzed replays of my own gameplay to correct my mistakes. I'd schedule my life around daily practice in order to improve; if I got home too sleepy, I'd set an alarm a few hours before work so I could get some training in at my peak alertness in the early morning. I would get friends together at the internet cafe and captain our drafts in a way that maximized everyone's strengths. But that impressive discipline faded with the summertime and my relationship with the game slid into habit. Eventually it just became something I thought I was supposed to do, rather than something I really wanted. I stopped improving because I stopped working so hard at it; yet I continued in wanting to improve and so was continually frustrated and disappointed. For most of the second year of my time in Dota 2 I was playing on my girlfriend's gaming laptop she had gotten for free. This obviously lead to some conflicts between my desire (need?) to play and her own use of her computer, so I started my first-ever PC build. I scouted out good deals and assembled the machine one piece at a time -- all motivated by the desire to play Dota 2 on my own time, and my own terms. In July of this year I completed my rig, complete with headset, wired mouse, mechanical keyboard... but when I returned to playing Dota 2, something had changed. The basic frustration which filled me in the course of a game was much easier for me to see, for some reason. Something had to give, eventually. I think investing in the gaming rig pushed my addiction to its breaking point. It was probably the largest sacrifice I'd made to facilitate my access to Dota 2 and maybe with that, I finally realized it was something that just... wasn't all that worth it to me. I quit playing Dota 2 for three weeks this month. That sounds pathetic. But it's been liberating. My life's improved in every field since letting go of my attachment to this one, admittedly amazing, game. I've finally been exploring the dingier corners of my Steam library and really enjoying myself. Some friends got me into Heroes of the Storm, Blizzard's much-simpler and much-sweeter reclamation of the free-to-play battle arena genre. It is similar to Dota 2, but it's overall much less serious. I don't get that anime thingy on my head playing it with my friends anymore. If Dota 2 was a pack of smokes a day, then Heroes of the Storm is the gum-chewing habit I've replaced it with: perhaps not entirely healthy, and certainly not free of the habit, but a whole helluva lot healthier than before. This goes way beyond gaming for fun. Evil Geniuses take home the Aegis trophy at TI5. The main rift between Dota 2 and HotS or even LoL, is that Dota 2 is not, first and foremost, an actual game. I mean, it looks and quacks like a game. It would be ridiculous to say it isn't a game at all. But it's been built and maintained to be a fair, and competitive, activity. Indeed Dota is designed as a sport more than anything. And HotS is a game. Doing Dota properly is more similar to working a job, a career, than unwinding with some chaotic fun; or at least that's what it was for me. One of my friends who still plays Dota occasionally invited my to come play a few days ago. I cleared my mind and thought for a second, and you know what? I did want to play. We queued up and expected the worst... but everything went fine. We laughed at the trolls together, we set up insane ganks together. We were playing as friends, for fun, with no delusions about high achievement or selfish comparison. We had an adventure together that left me feeling happy once I, uh, re-entered my flesh body. And that's exactly what gaming IRL should be.